It’s the All-Star break. Not only in the MLB, but also in my OOTP season. I’ve been simulating managing the Red Sox for the 2017 season. As mentioned in an earlier posting, just like in real life, the tough Boston media is skeptical of a new manager, but I’m determined to prove them wrong. This isn’t the only place where the game imitates reality. My team has been beset with injuries. At one point all my 2nd base options were on the DL. Not just Pedey, but Rutledge, Marrero and Hernandez were all out at the same time, forcing me to improvise. And don't get me started on the pitchers. This is starting to sound a bit too familiar! With Price on the DL to start the season, I had Brian Johnson filling in for some games. And he performed admirably, until…. Luckily this virtual injury is for much longer than the real one, and although I won’t be able to use the AC/DC singer until late next season, the real Johnson is available to John Farrell’s pitching staff now. One of the highlights of the first half was the first sweep of the season, for which I earned this achievement. I am very happy that it was the Yankees that I accomplished this against! 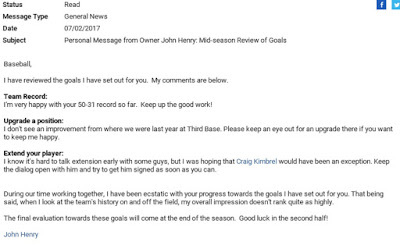 A week or so ago, I received a mid-season review from John Henry. He was quite happy with the record I managed this team to so far but I had to chuckle when I saw him say “I don’t see an improvement from where we were last year at 3B. Keep an eye out for an upgrade to keep me happy”. This sounds verbatim what all of Red Sox Nation has been griping about all season too! 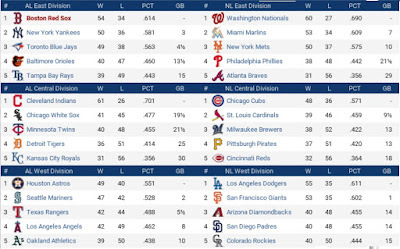 Heading into the all-star break, the virtual Red Sox are in 1st place, 3 games ahead of the Yankees. They are sending 4 players to the MidSummer Classic, including Chris Sale and Mookie Betts. This all sounds very simliar to what is actually happening. However they are also sending Jackie Bradley, who was the virtual league's leading vote-getter, and Rick Porcello who is duplicating his Cy Young campaign of last year. Can you imagine our real-life rotation, if Porcello was the ace? A lot of familiar teams leading their divisions. This is an extremely fun and addicting game. 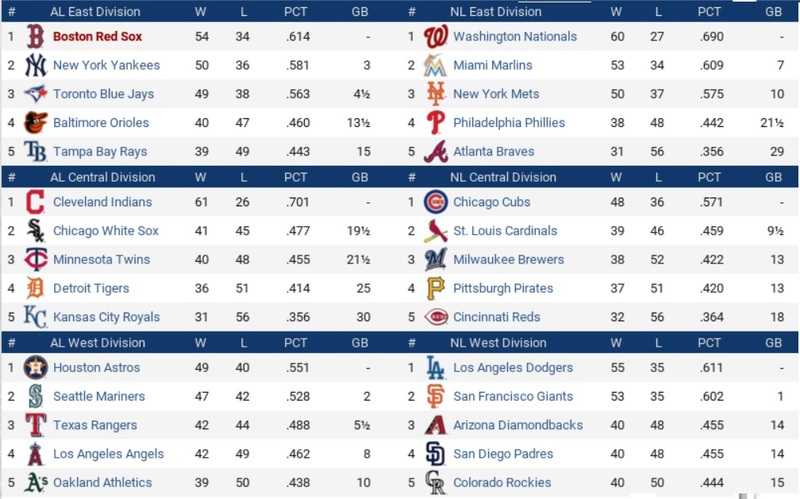 And the good people at OOTP have an all-star break promotion going on right now. You can get OOTP 18 for just $19.99, half off the regular price. As well, you can get MLB Manager 2017 (it’s a way to play on the go, for iOS and Android) for just $1.99. This sale expires Friday morning, so if you’ve been procrastinating, this is the best time to buy either of these games. 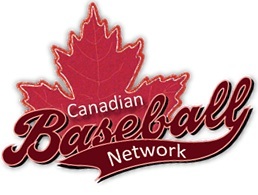 Not only do you get to try it out at this low price, but you will have something to do during the four days without any meaningful baseball to watch. I will keep running the season through the end of the playoffs. I hope I have the opportunity to manage Red Sox games through October and see how far I can get in the post-season. Keep your eyes on these pages for further updates, and to see how successful I ultimately am. I would love to hear from readers who are also playing this and compare our results.